My opponent [referring to Maxine Waters] only passed 3 bills in Congress in 27 years. Is this true and how does an average person like me verify this assertion (and others like it)? In my own effort to answer this, I looked into votesmart.org and govtrack.us. At a very cursory glance, the assertion seems false as Waters voted on more than 3 bills that at least passed the House. But I'm not confident in my judgment as this is the first time I think about checking this kind of assertion. I have no stake in the assertion being true or otherwise. In the interest of giving the assertion some benefit of doubt, however, is there an interpretation of the assertion that makes it true? The information you're looking for is available on govtrack.us, but you need to know what to search for. In this context, "passing" a bill (without any qualifiers) generally means introducing it and having it become law. It may or may not include bills which were merely co-sponsored, but in my experience, when they do, it's explicitly called out. If you want to include Concurrent Resolutions, which are bills that both houses agree to but aren't actually laws, then she's passed five bills. Simple Resolutions (bills that pass a chamber but don't even go to the other one) add three more, for a total of eight. However, it's reasonable to not include resolutions, since they have no binding impact and are often passed without a formal vote. She also introduced two bills which were not passed, but had some portion incorporated into another bill which did pass. These generally wouldn't count as "bills passed", but are certainly part of contributing to legislation. From the Advanced Search for Legislation page, it appears that Representative Waters has sponsored 5 bills since 1973 that have been enacted. Three of them were enacted and signed into law and the other two were incorporated into other legislation and subsequently passed. I would assume, to be charitable, that the two bills that "didn't count" were overlooked by mistake. 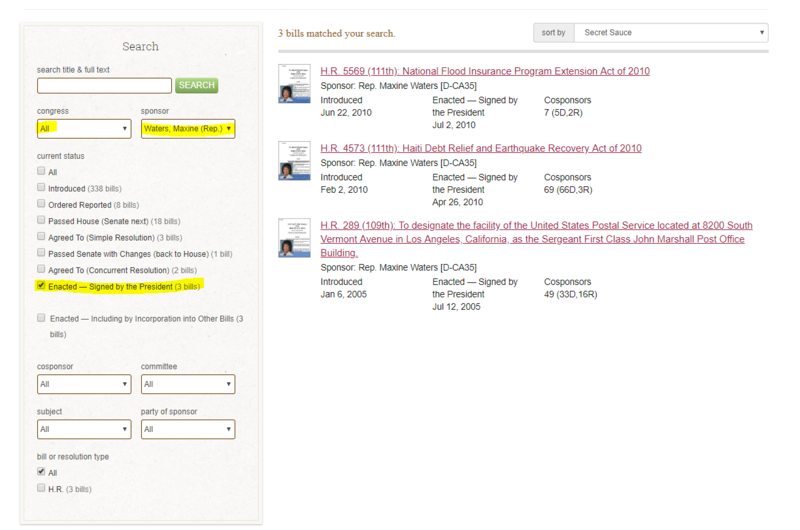 On that same page, you can see that she sponsored, or is currently sponsoring 338 bills from that same time period. Not the answer you're looking for? Browse other questions tagged united-states congress government voting-records or ask your own question. In the U.S., why are most bills that reach the floor for debate in Congress not controversial? Could Obama have passed Obamacare in the first 2 years when the Dems controlled both houses? How does the President get last-minute bills when Congress passes them just minutes before a deadline? Must bills introduced in Congress be completed within that term? What is the process by which an already passed law can be altered by Congress? In the US Congress, how is it decided which bills get voted on? How are U.S. Congress bills assigned their number? Why do bills with a veto-proof majority in Congress go to the President?